Rose Chapel was a wonderful venue with excellent service. They answered every email, and helped make sure everything went smoothly. The venue is well kept, and the have tons of useful stuff on hand. Roy did an excellent job on our wedding day. They work hard & provide great service. Thanks Rose Chapel! LOVE THIS PLACE!! Everyone was so helpful sweet and nice. Wonderful place for any type of wedding. We had a football themed wedding and everyone that was there helping did a wonderful job. Made my day stress free and VERY enjoyable. Would highly recommend. What a beautiful venue and a great staff. It was perfect in every way. I couldn't have imagined a more perfect place for the ceremony. Rose Chapel was a great venue to have a beautiful wedding. The staff was awesome and professional. We really loved Minett, she was there to see the wedding a success and did a great job! Roy was also an awesome part of our day and everyone loved his personality. Thank you for choosing Rose Chapel and allowing us to to be a part of your special day. We strive to make each wedding amazing for our brides. Congratulations and thank you from everyone here at the Rose Chapel. 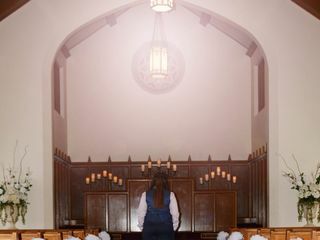 We hired The Rose Chapel servers to cater our reception since it was more affordable than hiring the caterer's service team, and we were thrilled with the service they provided. They worked hard and were very professional. If you are looking for a beautiful venue that is multi-functional, flexible and has competitive pricing, you must check out The Rose Chapel! The ladies that work this chapel are the nicest women ever. When you talk to them they are genuinely happy for you and definitely excited. The venue has so much character too.. 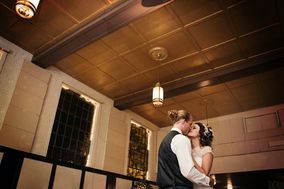 I was looking for a venue that wasn't just a big room with blank walls and the Rose Chapel was a PERFECT find! Love it Love it. BOOK THEM. We had an absolutely AMAZING experience with the Rose Chapel. There were a couple of things that we had left behind on the day of, and they were so kind in helping out. They did more work for us than anticipated with set up and tear down. They were wonderfully flexible with our schedule, and were very specific and detailed in all of the consultations. Such sweet people! All of the ladies at the Rose Chapel were so helpful and friendly! This venue really made our wedding perfect, I LOVED the garden for our ceremony! The garden and the ballroom are so beautiful. They required we hire two waitstaff because we catered the wedding ourselves and I am so glad they have this rule! The waitstaff did a great job keeping the buffet clean and my popcorn bar full. I am so glad we didn't have to ask any of our family or friends to take care of any of that. Finding the Rose Chapel helped me achieve my dream wedding without blowing my budget! Rose Chapel was a beautiful venue with awesome staff! Everyone was really supportive and guided us along the way. Our wedding day was so very smooth! I was so pleased with the outcome! The Rose chapel has a great enthusiastic staff. The venue is beautiful with historic charm. The rose chapel is highly recommend. Beautiful venue. Great staff. Very easy to work with. Joni Morris and the staff of Rose Chapel are absolutely the best! We had our dtr's wedding and reception with 150 guests and they handled everything like true professionals. I would Absolutely recommend this location for any special event. I found Mrs. Morris to be extremely friendly and an expert at calming nerves! Every recommendation she gave us worked out perfectly. A tremendous success and I will be forever grateful! Simone was usually my go to person by email and she always answered my questions within a day. We made a few changes the day of the wedding (moving the ceremony indoors versus out in the courtyard) and they didn’t miss a beat. We’ve never met so many people who were as excited as we were about the wedding. Their enthusiasm is contagious! Thank you, Jan for all your help on the day of. It was amazing being able to “relax” and not having to worry about all the little and big things. Highly recommended. Everyone kept telling us how beautiful the chapel was and the grounds. Joni and all the crew at Rose Chapel were the upmost blessings. Being the mother of the bride they made my job so much easier. Joni is such a wonderful help in organizing everything. If I ever have another big event I will be using them again. Can't say enough about them. Beautiful and a great value hand in hand. The Rose Chapel is a beautiful venue and the service that is included with the price of the venue is amazing! They provided assistance with the ballroom and chapel setup, they provided a coordinator the day and night of the event along with a couple of other staff to assist with whatever you needed. I LOVED doing business with this facility and their staff were wonderful to work with!! Simone was a huge help on the entire day. Definitely recommend this venue. Our experience was fantastic. The ladies are very professional, helpful and courteous. We loves our time at the Rose Chapel. After searching venues in Tarrant county area, the Rose Chapel was by far the best venue. Besides being a beautiful place; it was also affordable and includes everything you need for your dream wedding. The Rose Chapel staff was professional, helpful and caring; Joni was the best wedding coordinator a bride could ask for. Our guests gave us many compliments about our choice of venue. Many thanks to all the staff at Rose Chapel for making our wedding day special. I loved having my wedding at Rose Chapel! The best part about the place is the coordinators that help you. They did the set up, break down, confirmed with our vendors, and made sure everything ran smoothly the day of. They went above and beyond for us to make sure we had the perfect wedding. 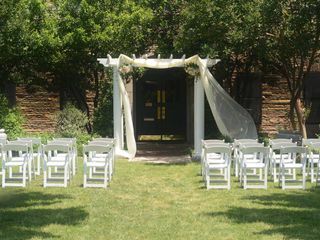 The garden was absolutely gorgeous for our ceremony. I decided upon this venue initially based on the value and how sweet all the ladies were when I first toured this venue. They exceeded my expectations to the very end!!! I looked at a lot of places and I can honestly say this is the MOST beautiful place and the BEST value in the DFW area! The courtyard is breathtaking and the building reminds me of an old English cottage you would find in the countryside. The ladies were so sweet and willing to do whatever necessary to make my day perfect. I used their wait staff and my entire event ran perfectly. I also used a few recommended vendors from their list, and was blown away by their services as well!! The staff were wonderful. Very helpful and accommodating with all of my needs. Made the evening relaxed and very easy to enjoy.